Synopsis: The dead don’t tell secrets… unless you listen. These books do need reading in sequence (and it really isn’t a chore reading them all! ), because whilst the actual storyline in each book is standalone, the back stories are important to truly understand DI Kim Stone, her team and not forgetting journalist, Tracy Frost. Play Dead opens with he first person narrative of an unknown character talking about someone who we understand is their mother, who has very recently died. The narrative then switches to present day whereby Stone and Bryant are watching a house, waiting for a warrant to enter the property. Stone, as impatient as ever changes tactics in order to gain access to the house in a different way, temporarily becoming Bryant’s wife. Once this investigation is completed, the team are sent on a field trip to a local body farm to understand what they do and the help that their findings have upon investigations. It is during this visit that a young woman’s body is found and it is clear that she has been murdered. I personally love Stone; she is strong and ballsy, copes with her past by focusing on her career and building a strong team around her – although she is careful to stay aloof from them, not letting anyone in too close, other than Barney, her loyal canine companion. Interestingly in this book, we see a different side to the journalist Tracy Frost – we learn more of her character and why she is the person she portrays herself to be. I really enjoyed this element of he book, seeing the dynamics between Stone and Frost shift. The pace of this book is relentless, it had me guessing the whole way through and just when I thought I knew what was going, another theory was ruled out! Marsons currently has a 8 book deal for DI Kim Stone which I am very grateful for as I don’t want Stone to go anywhere just yet! After much urging from her partner she began to enter short story competitions in Writer’s News resulting in a win and three short listed entries. She used the Amazon KDP program to publish two of her earlier works before concentrating on her true passion – Crime. 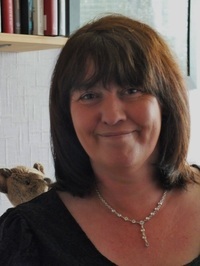 After many, many submissions Angela was signed in a 4 book deal to Bookouture as their first crime author. It certainly does not disappoint!